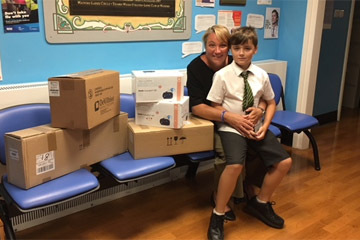 A young physiotherapy patient and his mother have donated an ultrasonic nebuliser machine to Watford General Hospital. Billy, with support from his mum Nicky, donated the machine which will help us to take lung samples from our young patients at Watford General Hospital and means families won’t have to travel to London for the tests. The machine delivers medicine by using high-frequency vibrations to turn liquid medication into a mist. This fine mist is then inhaled by the patient via an attached mouthpiece or mask. In order to raise the money, Nicky and her friend Kayleigh organised a fundraising event named ‘Billyfest’, which they run annually in support of local causes. Held at Aldenham social club in July 2018, the event was a huge success with music, food, stalls and more for event-goers to enjoy. Nicky said of the event: "The festival is always such a success because of the continued support from family, Billy’s friends and all of our friends for which we are so grateful." Catherine Barraclough, specialist paediatric physiotherapist at West Herts Hospitals, said: "We are so fortunate to receive this support from Billy and Nicky. The equipment plays such an integral part in the management of our patients, and for that we can’t thank them enough." For more information please contact communications team at West Hertfordshire Hospitals NHS Trust on 01923 436281 or email. Out of hours, please call 07900 228031.